The Juno mission to Jupiter is the subject of a new, short documentary, "Destination: Jupiter." A new documentary celebrates the 5-year, 1.74-billion-mile (2.8 billion kilometer) journey of NASA's Juno space probe, set to arrive at Jupiter on July 4. "Destination: Jupiter" promises to give viewers "an exclusive, behind-the-scenes look into the story behind the [Juno] mission," according to a news release from CuriosityStream, the online streaming service where the documentary can be viewed starting today (June 24). The short documentary includes interviews with Scott Bolton, Juno principal investigator at the Southwest Research Institute in Texas, and Steven Levin, project scientist for Juno at NASA's Jet Propulsion Laboratory. 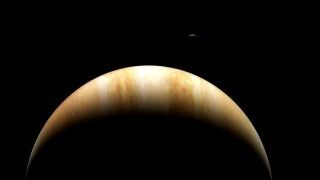 Destination: Jupiter Trailer from CuriosityStream on Vimeo. Noah Morowitz, a co-executive producer on the film, told Space.com he was looking to create something that was understandable even to those who don't have a background in science or space, such as himself. "When I first heard about [Juno], I went on to the NASA web page and didn't even understood what they were talking about, even what the purpose of the mission was. It was inside baseball," he said. As he worked on the documentary, he said he began to understand that much of Juno's science goes beyond Jupiter and into solar system history in general. "In one of the soundbites, Bolton talks about Juno and says it could show us the recipe for making solar systems," Morowitz said. One of Juno's mission objectives is to look for water ice inside of Jupiter, which could reveal if Earth also started out with water on its surface, or if it came from elsewhere, Morowitz said. Juno will also seek information about Jupiter's core and more information about its magnetosphere, which are things that could be extrapolated to giant planets more generally. "Destination: Jupiter" is available exclusively on CuriosityStream, a subscription-based streaming documentary service. New subscribers can try the service for free for 30 days. The Juno documentary follows two previous space series by CuriosityStream: "Destination: Pluto" (about the New Horizons mission that flew by Pluto in 2015) and "Destination Mars," which focuses on initiatives such as the privately funded Mars One that eventually plans to send astronauts on a one-way trip to the Red Planet. Destination: Jupiter is produced by the United Kingdom's Arrow Media. Morowitz said no other space films in particular are planned at this time, but eventually he expects that at least another Mars documentary would be produced. "There are lots of different people working on Mars," he said.